Coincidence and a steady, continuing search delivers answers. 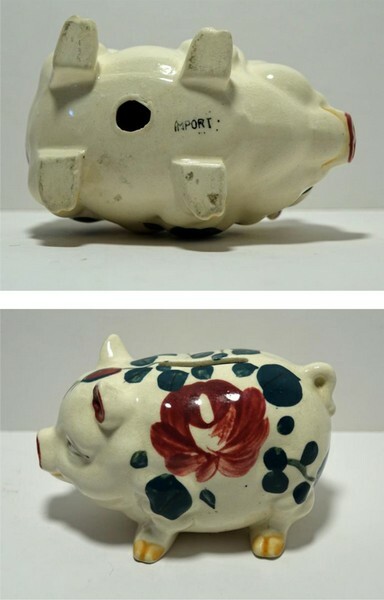 About the provenance of a piggy bank I mean. 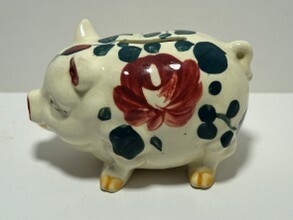 I bought the piggy bank as shown on the picture via Tradera.com in Sweden. With the hallmark ‘Import” and a tiny hole in the belly bottom. The hole is not meant for a plug but to pore the slip out of the form/ mould. Usually those holes are closed with clay or widend so a plug or stopper can fit in (to get the coins out). 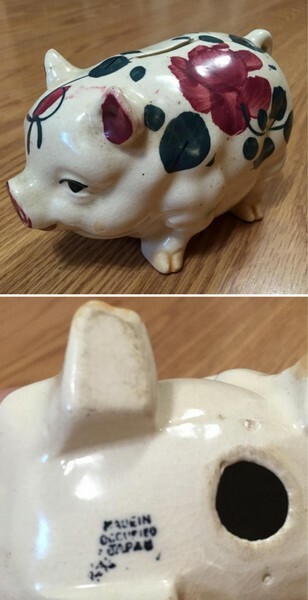 This piggy bank was marked Import to export it. Does it give a clue about the period the piggy was produced? I thought so, but came to the conclusion that these kind of mandatory hallmarks (Trade acts) were often misused. My guess it that this is a piggy from 1920-1940. Evidence about the provenance was given by a similar piggy I discovered on Collectors Weekly that is hallmarked “made in Occupied Japan”. So between 1947 and 1952. And it’s made in Japan. So my piggy bank number 1013 traveled from Japan (export) to Sweden (import) and half a century later by Tradera to The Netherlands. And the period is 1920-1940.